Gold climbed as much as $18.10 to $1737.20 by a little after 9AM EST before it fell all the way back to $1720.41 by a little after 2PM, but it then bounced back higher in late trade and ended with a gain of 0.59%. Silver surged to as high as $33.942 before it fell back to as low as $33.09 and then also rebounded, but it still ended with a loss of 0.33%. Euro gold rose to about €1323, platinum gained $7 to $1633, and copper remained at about $3.80. Gold and silver equities traded slightly higher for most of the morning, but they then fell back off a bit in afternoon trade and ended with modest losses. “A few members of the Federal Open Market Committee meeting said the central bank may soon have to consider more asset purchases, while others said the economic outlook would have to deteriorate first. Tomorrow at 8:30AM EST brings Initial Jobless Claims for 2/11 expected at 365,000, Housing Starts for January expected at 671,000, Building Permits expected at 675,000, and PPI for January expected at 0.3%. Core PPI is expected at 0.2%. At 10AM is the Philadelphia Fed for February expected at 10.0. Oil remained higher after the Energy Information Administration reported that crude inventories fell 200,000 barrels, gasoline inventories rose 400,000 barrels, and distillates fell 2.9 million barrels. The U.S. dollar index turned slightly higher after the euro fell on news that Greece’s latest bailout package is getting delayed. Treasuries ended slightly lower in mixed trade. The Dow, Nasdaq, and S&P fell on worries about Europe. Among the big names making news in the market today were Zynga, Yahoo-Alibaba, JPMorgan, HSBC, Deere, Kellogg and Pringles, and BNP Paribas. 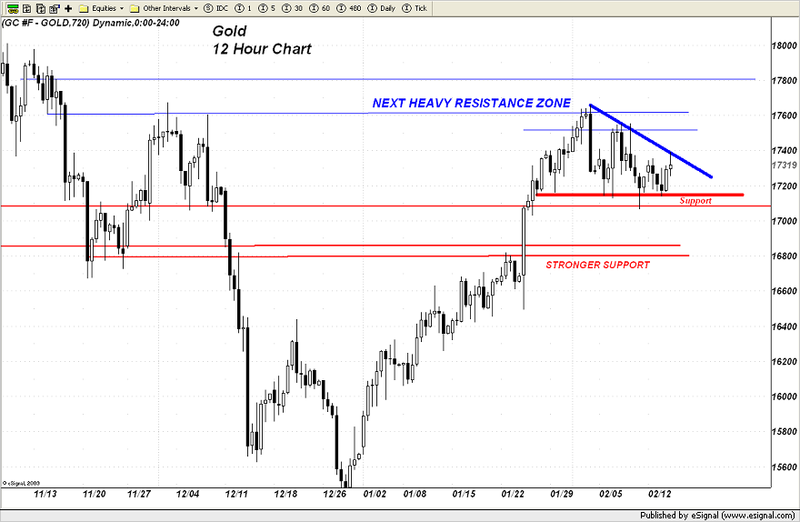 “Gold is holding firm in today's session but has retreated from its best overnight levels. You will notice that within the larger time frame on the chart, gold has made a nice run to stiff resistance beginning near $1760 and then retreated. Buying on the downside coming in near the support level marked (close to $1720) has been extremely consistent over the last two weeks however. The result has been a constricting triangle forming which is a consolidation pattern. Bulls cannot take it through resistance at this point but neither can the bears break it down. I happen to believe that the reason the latter cannot accomplish their intent is the reality of gold strength across a variety of other world currencies. Bluntly - the price of gold is holding in terms of all of the major currencies as savvy investors/traders are well aware of what the monetary authorities are doing to their respective currencies in order to keep the game of musical chairs, aka - the global economy - going. Central Bankers and monetary authorities are doing what they were born to do, namely, destroy the value of their nation's currencies to benefit the big international banks within their midst. Gold is all too well aware of that and is doing what it always has done and always will do - function as a currency of last resort and a refuge from their depredations. What we want to watch for in gold is a breach of this triangular pattern with a close preferably above the $1750 level to kick this thing up into that heavy resistance zone noted. Obviously gold bulls would want to see dips below $1720 meet with strong buying and an almost immediate return back above that heavy red line shown. As another quick note of reference, check out the price of Gold compared to the price of the US long bond in the following chart. Note that going back to early 2009, when QEI was still in force, gold was the asset that investors favored in relation to the US bond market. 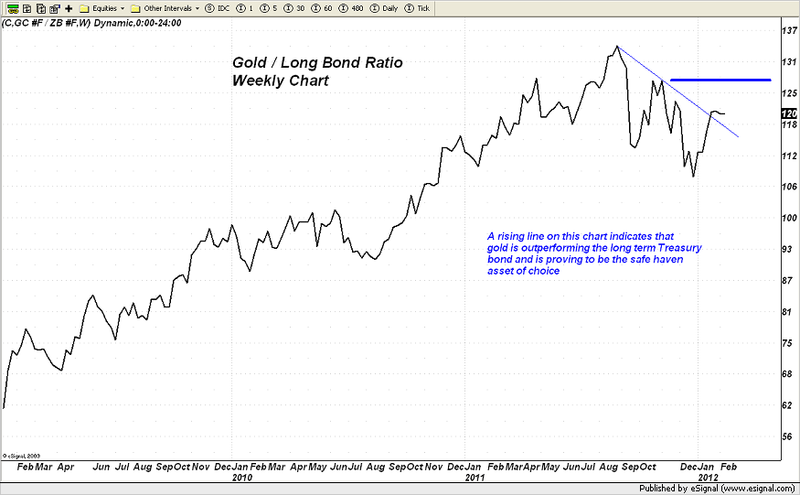 After a brief dip lower in this ratio during the middle of 2010, when investors were fearful that another round of QE was not going to be forthcoming, the ratio returned in favor of gold until it peaked just after QEII expired and the Fed had nothing really significant to replace it. From that point on, bonds have been a better investment than gold. That might possibly be changing at this point as interest rates crawl along at abnormally low levels and investors become more fearful of currency debauchment. The downtrend line in this ratio has been broken but has a bit more work to do in order to look more convincing. A move through the heavy blue line shown would do the trick. Note: Change in Total Tonnes from yesterday’s data: SPDR subtracted 0.384 tonnes. Silver Trust (SLV) Total Tonnes in Trust: 9,624.97: -33.25 change from yesterday’s data. Barrick’s (ABX) dividend, Northern Dynasty (NAK) Environmental Baseline Document, AngloGold’s (AU) full-year adjusted headline earnings, and Silvermex’s (SLX.TO) fourth quarter production results were among big stories in the gold and silver mining industry making headlines today.